"...it's not about fighting, it's about not fighting"
ACS Martial Arts, run children's jujitsu classes 5 days a week. 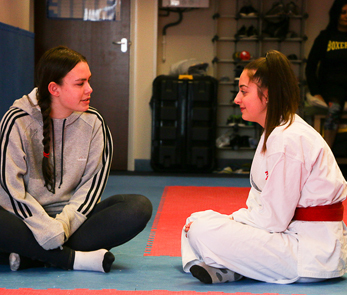 Children can start training in our jujitsu classes from age seven, prior to this age they can attend our Minininjas martial arts games classes. So what do the kids learn? Well they learn that true martial arts isn't about fighting - just the opposite. Sun Tzu, a famous Chinese general, military strategist, writer, and philosopher who lived in ancient China over 2,500 years ago wrote, 'The Art of War' which featured many instances on how to win a battle without ever striking a blow: "fighting without fighting." That doesn't mean never having to resort to physical force or use of aggression, sometimes the situation leaves no other choice but to repsond in kind. What it does mean is that physical responces should always be a last resort when walking away and talking your way out have failed. Children learn a jujitsu curriculum that is similar to the syllabus used by the WJJF but with many additions and ommisions. It's a system of graduated learning involving 8 belt grades from novice to black belt - although you must be 18 to grade for black belt under our system. But, more importantly, children also learn other skills not included in the syllabus that represent how to deal with real world aggression within the confines of UK La w governing self defence and reasonable force.Any martial arts school teaching self defence without recourse to the laws governing physical and reasonable force should not be teaching self defence - we teach both. We also include 'contact' and rough and tumble in our kids classes. Children need to be exposed to aggression and simulated violence in order to 'target harden' them and help avoid the 'adrenaline freeze' that effects many of us when exposed to uncomfortable or frightening situations. We spar (punch and kick) we grapple standing up and on the floor and we can get rough ... but that's the point! No contact martial arts breeds a complacency that comes unstuck when presen ted with violence on the street.We encourage kids to challenge themselves both in and out of the dojo, to do the things that make them uncomfortable and, as a result, they grow in confidence and become less of a target.